Leaf, Ice, Patch, Little. Ceremony Time~! Clan/Rank : I'm currently inactive from the site due to life. Padding quietly out of the warrior's den, Nightbird approached the crowd of cats in the clearing. Noticing the bouncing kits who mostly had groomed pelts, the she-cat concluded it was their ceremony. Even though she had never met the young cats, she was proud of them. 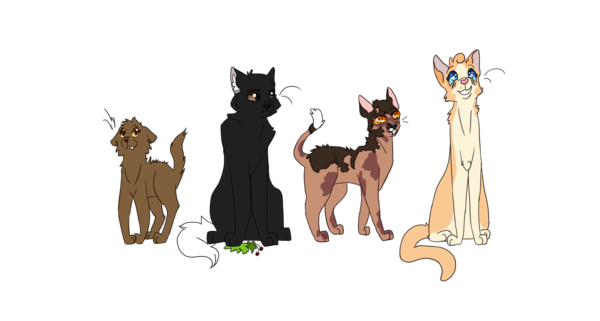 In a few seasons' time they would become fine warriors of Riverclan. Wondering if one would soon be her apprentice, the black tabby sat and curled her striped tail around her paws. Shaking her head to clear the thought, the warrior reasoned with herself. You already have an apprentice. But no one's seen Greypaw for a while now. So? What if you get one as your apprentice and then Greypaw comes back? What then? Forcing her inner conversation to the back of her mind, she focused on the ceremony at paw. OOC: Omb. I ment Froststar. Sorry! Leafkit looked at the other kits, and licked her paw, swiping it gently over her ear. Her paws twitched with eagerness, and hoped to be given a good mentor. Of coarse, all of Riverclan was great, but she had that secret hope to be Froststar's apprentice, much like any kit; of what she knew. Icekit looked around and saw more kits. She walked up to Leafkit and meowed, "Can you believe it?! Our apprentice ceremony!" "Littlekit, Patchkit, Icekit and Leafkit. You have each reached the age of six moons, and it is time for you to be apprenticed. From this day on, until you receive your warrior name, you will be known as Littlepaw, Patchpaw, Icepaw, and Leafpaw. Littlepaw, your mentor will be Nightbird. Patchpaw, Mintcloud will be the one to mentor you. Icepaw, Mapleclaw shall be your mentor. Leafpaw, I will mentor you." ooc: sorry! I was waiting for everyone to post and never noticed when y'all did. Oops! "Littlepaw! Patchpaw! Icepaw! Leafpaw!" Reedheart cheered, raising his voice to be heard. He couldn't explain it, but he had such a soft spot for kits and young apprentices. Whose day couldn't be brightened up by excited and eager young warriors? Perhaps I'd be better as a queen than a warrior. he jabbed at himself silently because the poor sod doesn't have any friends to make fun at him, so he has to fill the void himself. Leafpaw's face lit up greatly as she heard that the leader was her metor. Her leader. "Thank you, Froststar." She mewed, somewhat silently. "Icepaw! Littlepaw! Patchpaw!" The apprentice would have touched noses with her mentor, but she didn't feel authorized to gowhere her leader was. Littlepaw got up excitedly, dipping his head to Froststar and running off to Nightbird. Icepaw looked around happily. She looked around for Mapleclaw, so she could touch noses with her mentor, but couldn't find her. Patchki-paw's face brightened with a warm smile as her mentor and new name was announced. She sighed happily and searched the crowd of cats for Mintcloud. Mapleclaw blinked in surprise, looking at Froststar. Sure, the she-cat had been hoping for an apprentice but she hadn't been expecting to get one! She pulled herself to her paws and made her way to where her new apprentice was, lightly touching noses with Icepaw as she grinned to herself. She was going to make Froststar proud! Icepaw purred as her mentor touched noses with her. I will make you proud! Icepaw thought happily. Subject: Re: Leaf, Ice, Patch, Little. Ceremony Time~!